NAPA, Calif. --Marshawn Lynch, speaking to reporters for the first time since he sat during the national anthem prior to the Oakland Raiders' exhibition opener on Saturday, declined to say exactly why he remained seated on a cooler. Lynch was asked about the "elephant in the room" as he stood at a podium for a five-minute media session following Thursday's final practice of training camp. "I think that elephant just left the room because a little mouse ran in here," Lynch said. "Didn't they say elephants was scared of mouses, or something? That m-----f----- left, cousin." Raiders coach Jack Del Rio said after the game that Lynch told him sitting was something he had done for 11 years, although photos have also shown him standing during the anthem in previous seasons. According to Del Rio, Lynch told him, "It's not a form of anything other than me being myself." Del Rio then shared his thoughts with Lynch. "I said, 'So, you understand how I feel, I very strongly, believe in standing for the national anthem, but I'm going to respect you as a man,'" Del Rio said on Saturday. "You do your thing, and we'll do ours.' That's a nonissue for me." Lynch was asked Thursday if Del Rio gave him the freedom to be himself while being a part of a team. "Yeah, because on Doctor-24, it's a designed way that you're supposed to run it, but I have all freedom to go any way that I choose to run it," Lynch said, to raised eyebrows. "I would say yes." Does playing for his hometown team rejuvenate him? "To be honest, I would say just getting my mentality back to waking up early and getting it going and doing something physical, in order to get my body back to its playing ability," he said. "That was the hardest thing for me because I'm not a morning person. After that was over, it was straight." Did Lynch miss playing football while he was retired last year? Lynch, who entered the NFL as a first-round draft pick out of Cal in 2007, has been seen as a big brother type to second-year running backs DeAndre Washington and Jalen Richard, who said Lynch told him he took too many hits, as well as rookie Elijah Hood. "They're all talented," Lynch said. "The biggest thing is that most of them probably were watching me when they were in middle school or high school, so it's kind of crazy. I call all of them my kids so I'm their daddy. "But to watch them work and see the work that they put in is a blessing and at the same time, I want to make sure that I uphold their standard of what they put on film. They're all good so I just want to make sure that I fit in with them and continue to just run the ball like the Raiders have been doing." Lynch was also asked if it mattered to him if people wearing his jersey at the Raiders' home exhibition opener this Saturday against the Los Angeles Rams sat or stood during the anthem. He did not answer that question directly, either. Rather, he described a play. 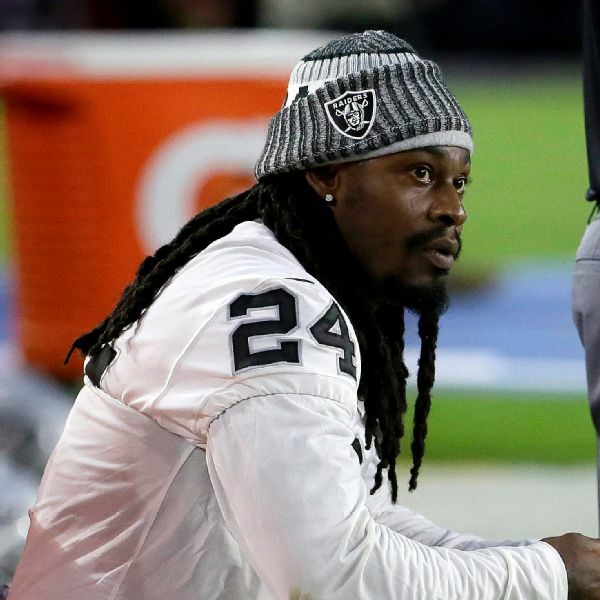 "So, when we run a '74' or something like that, where I've got to scan or read, both sides, that will be pretty difficult for the most part," Lynch said. "But I'm a veteran so I can make it work."